A woman searching for her missing son who returned from war but never came home. A man who was reported to the authorities by his neighbors because he refused to purchase war bonds. A soldier who was sick and tired of being stuck in the mud, and another who wouldn’t change places with the president of the hometown bank. A community hard hit by the deadly Spanish Influenza Pandemic. Come hear these stories and more at a performance hosted by the Heritage Alliance on Sunday, April 8 at 3:00 p.m. inside the Jonesborough/Washington County History Museum. 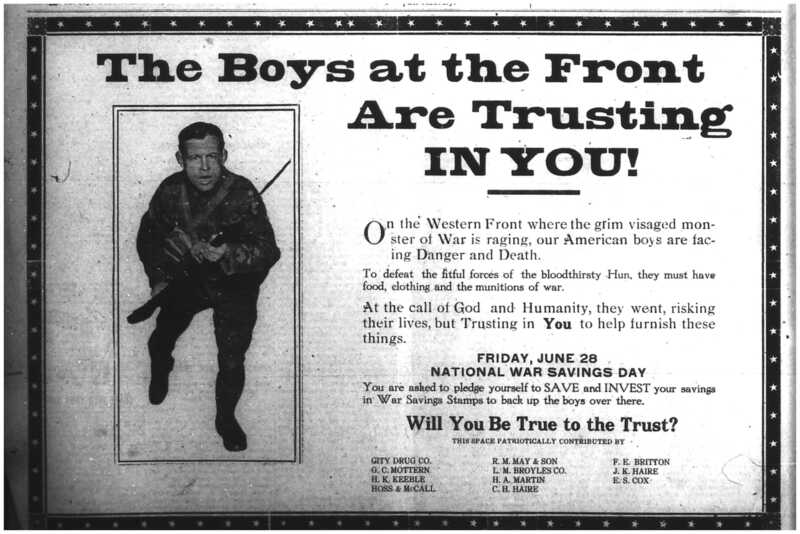 This Readers’ Theatre piece will share firsthand accounts of the lives of Washington County citizens during World War One. “While doing the research for this piece, I was struck by the similarities between now and then, even though a century has passed,” shares Special Projects Coordinator Anne Mason. “It was a time of suspicion in America, where neighbors spied on one another and turned each other in for un-American activities. 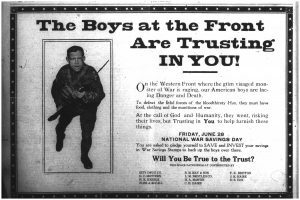 World War One was a devastating war overseas, and its chaos was definitely felt across the Atlantic.” Join the Heritage Alliance on April 8, and hear the struggles from overseas and on the home front as century old newspaper headlines come to life. The Jonesborough/Washington County History Museum is located inside the Jonesborough Visitor’s Center on Boone Street. The Heritage Alliance is hosting its very first Homeschool Day all throughout Jonesborough on Friday, May 18. The cost is $7.00 per student, no matter the amount of activities. Parents, guardians, and non-participating younger children are free of charge. However, due to space limitations, not all chaperones and non-participating children will be able to participate in every activity. Activities that day include lessons in Oak Hill School, a one room schoolhouse restored to the year 1892, Town Tours, Old Jonesborough Cemetery Tours, and hands-on activities with artifacts in the Jonesborough/Washington County History Museum. In addition, students can participate in history hunts at the Chester Inn State Historic Site and Museum, listen to a Storyteller, and participate in train based activities in the Chuckey Depot Railroad Museum. Archeological activities will be offered in the morning, and older students will have the opportunity to solve the mysteries surrounding the Cholera Epidemic of 1873 through various primary sources. It will be a day full of history and fun! To register, please complete the registration form and email it to Anne Mason at amason@heritageall.org, or mail it to the Heritage Alliance 212 East Sabin Drive, Jonesborough TN 37659. You can also call and register by phone at 423-753-9580. Registration form is available by clicking HERE. For a look at the whole day’s schedule, click here.